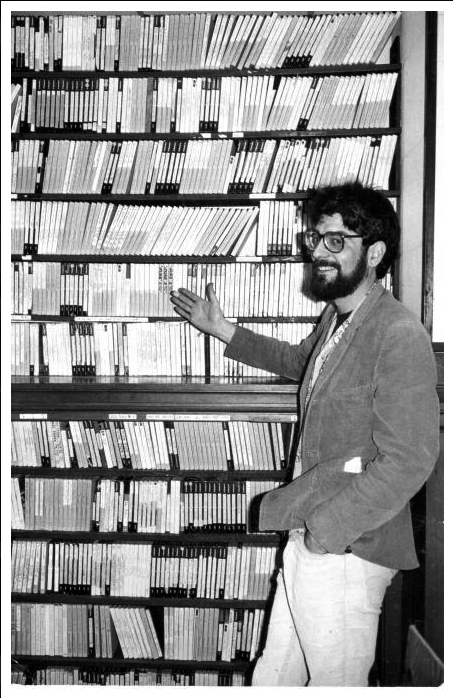 When Matt Martin, Manager of KALW Radio, heard me saying that mid-April marked the 40th anniversary of my life in radio, he asked that I write a personal radio history for him. The idea was to use this as background for an interview/article, but more important things (like running a radio station) got in the way, and he just decided to publish my mini-memoir in KALW’s Spring/15 Program Guide. Mark Varner read it and also published it in the May/15 issue of Bluegrass Breakdown. And Richard Thompson used it as the basis for an article in Bluegrass Today on April 20, 2015. My life in radio began when I built a wood shed with a chain saw. Well, the actual beginning was listening: Van Patrick calling the Tiger ball games, The Motown Revue on WAMM (but only 'til sunset), the Stanley Brothers and blues on WWVA, Russ the Moose Syracuse on WKBW, Larry Miller on KMPX, Bob-B-Q on KSOL, Radio Caroline, CBC, and much more. Somewhere in there, I began to both record concerts and make tapes of favorite songs on a portable cassette, activities which became the basis for my radio endeavors. In 1974, I was living in rural British Columbia and recognizing that the back-to-the-land thing was less than satisfying when I had the opportunity to join Vancouver Co-op Radio — as a carpenter. That wood shed was most of my carpentry experience, but the station was desperate. An abandoned bank building was being converted into radio studios, and finesse was not at a premium. The station was an initiative of a collective interested in providing alternative news and information, and, as I learned when I attended my first meeting, included no plans for broadcasting music. This seemed preposterous to me; remember that this is long before ‘talk radio’ and my opinion might not seem so naive. But ... I was told ... this was to be a community station, a way to give voice to the voiceless. Aha, thinks I. I went out into Vancouver’s Gastown district and asked Ed the Fiddler, a regular street musician, if he wanted to be on the radio. Despite having zero experience in this area, I wound up recording Ed and dozens of other area musicians during the year before Co-op Radio went on the air in April, 1975, and that tape library was the basis for the music heard during our early broadcast months. (see photo above) It also led to being appointed Co-op Radio’s first (and only) Music Director. Part of the job was driving 10” reels of tape, recorded at 3 3/4 ips, to a tiny shed just outside Vancouver; the money ran out before we had a functioning studio-to-transmitter link, so the first weeks of broadcast were via tape recorders at the actual transmitter. My first program was titled, initially, "Bright Lights" (with Richard & Linda Thompson's theme song), and then “Vancouver Extract” after the vanilla extract (libation of choice for the area’s street folk) bottles I had to sweep up from the "Pigeon Park" entrance outside the station each morning as I arrived for my next station job: Programme Director. By this point, I’d gone all-in on the community aspect of radio. My show presented a calendar and musical previews of all the non-classical performers appearing in the area. I still do the calendar/musical previews thing as part of “Bluegrass Signal,” as I still feel that part of radio’s mission is to connect the listener to the community, and providing information about where to hear or play music seems essential. I also was part of three live broadcasts from clubs specializing in folk, jazz, and blues/country/rock, as well as many other live events that were the basis of our weekly schedule, including poetry readings, radio plays, and lots of meetings: city council, labor council, all sorts of community gatherings, and yes, school board. (KALW broadcasts SF School Board meetings.) This emphasis in Co-op Radio’s schedule got us some attention as a station moving forward by reinventing the past; live radio was a key feature of radio’s “golden age.” Via another grant, I also co-produced a daily 6-9 am program that combined current affairs and contemporary culture. We took that show out of the studio every Friday, and had memorable broadcasts from a cannery, train station, aquatic center, and my kitchen. Once the station okayed having disc-based music shows, Jim Burnett and I launched a program called “Side Order: Platter Sandwich.” (Ask your folks to explain it, kids!) It was a way to find other fans who wanted to present music on the radio with some background and context, rather than randomly spinning whatever was on the top of the pile. This led to a series of weekly shows, and I was involved with a variety of them, encompassing rock, blues, jazz, folk — and country/bluegrass. The last one actually started because a couple of American labels were trying to get more Canadian airplay -- and it turns out that a great way to build up a record library is to title your program "The Rounder Roundup" — but those of us with similar musical tastes found each other. “Radio Ranch” was born, and remains a Sunday afternoon mainstay (albeit with a different name) on Co-op Radio. My thanks to all the sonic colleagues with whom I made radio in Vancouver, including Fred Michael, Sheila Fruman, Jim Burnett, Rod Heinz, Hildi Westerkamp, Paul Norton, Roy Forbes, Gwendolyn Reischman, Brent Kane, Rosemary Allenbach, Patrick Ready, Joan Anderson, Jim Bizzocchi, and hundreds of local and visiting musicians. The best radio has always been collaborative, and all of these people contributed to my radio evolution. My interest in bluegrass was less than other musical forms (blues, rock, jazz) until a college buddy sent me a cassette recording of the Stanley Brothers King 615 LP. I remember listening repeatedly to it, captivated by the vocal harmonies that were somehow familiar and alien at the same time, as well as the drive and soulfulness which were also hallmarks of my favorite music. That experience led to an ongoing involvement with a wide range of bluegrass and old time music, but it's safe to say that I've programmed more Stanley Brothers music than anything else during my forty years of doing radio. During this time, I was also teaching audio production and other media-related courses at a Vancouver college, and freelancing for CBC Radio. I produced numerous documentaries for CBC, and presented music on a number of different programs. I never took voice training (to get rid of my ‘merican accent) or became a Canadian citizen (you couldn’t have dual citizenship in those days), so never had my own show, but regular freelancing on top of teaching, doing film sound, and Co-op Radio was more than sufficient. In 1990, the Good Ol’ Persons played the Vancouver Folk Music Festival, an event at which I usually interviewed a number of performers. I got to talk with Kathy Kallick during that festival, and, long story short, wound up moving to Oakland and marrying her in 1994. As it happened, one of the regulars on KCSM’s “Sunday Afternoon Bluegrass” show was moving, and I joined that crew for the last year of the program (before the station switched to an all-jazz format), as well as filling in for vacationing KPFAers. JoAnn Mar and Kevin Vance were interested in increasing the acoustic music presence on KALW, and invited me to join them as part of a Saturday block of music shows. I did so in October, 1995, and have been producing and hosting “Bluegrass Signal” ever since. I’d wanted to title the program “Bluegrass Stomp” and use Bill Monroe’s tune as the theme music, but station management didn’t approve the name. So, I called it "Bluegrass Signal” and used “Banjo Signal” as the theme — until persuading John Reischman to write and record an original mandolin-based tune that could serve as the program’s theme. A couple years into the new millennium, Darrell Johnston from the California Bluegrass Association became interested in affiliating with the long-running all-bluegrass internet service of Washington DC’s WAMU, “Bluegrass Country.” The CBA became a sponsor, and Bluegrass Country began recruiting programs from outside Metro DC; they’ve carried the first hour of “Bluegrass Signal” since February 2004, and recently decided to present it daily (M-F) at 8 am (Pacific Time) via www.bluegrasscountry.org. Both KALW and WAMU are member-supported public radio stations. To help with fundraising efforts, I produced a 20-track CD of Bay Area bluegrass and old time musicians that is distributed to the stations’ donors. "In the Deep Rolling Hills of San Francisco” is a terrific collection of original songs, live and/or previously-unreleased recordings, and instant classics that provides a sampling of the area’s music circa 2013. It begins, of course, with John's great tune, “Bluegrass Signal.” More recently, I produced another compilation of Bay Area music that begins with "Bluegrass Signal." To mark KALW's 75th anniversary, I offered "Live On Arrival," a 21-track collection of live recordings. Details on both these albums are available here. Also in 2013, the CBA surprised and honored me with a Lifetime Membership Award. Although I feel unworthy -- I'd been a Californian for only 20 years and I'm not a picker -- I am deeply honored and most appreciative to be part of the distinguished group of people who the CBA feels have made significant contributions to the development of bluegrass in California. This web site (www.bgsignal.com) was established to publish playlists from all the “Bluegrass Signal” broadcasts, as well as provide a complete and constantly updated list of Bay Area concerts, jam sessions, instructional opportunities, dances, organizations, venues, and bands; California festivals, music camps, and radio programs; and a history of Bay Area bluegrass from 1959-2001. I gratefully celebrated my 40th anniversary producing and hosting radio programs on the April 11, 2015, “Bluegrass Signal” with a show of some favorite live music; the first hour of this special was repeated on WAMU’s Bluegrass Country on May 11-15, 2015. I’m also beginning to search for younger folks who might be interested in producing and hosting “Bluegrass Signal” when it’s no longer possible for me to do so. I’m hoping that those who have participated in the past year — Sully Roddy, Todd Gracyk, Jose Segue, Allegra Thompson, Leah Wallenberg, and Jacob Groopman — will be among those who can carry the program and the music forward. I hope others will join them. And I hope each listener will discover music to enjoy or educate or stimulate, and will be able to hear and/or play music in their community, because of “Bluegrass Signal." Producing and hosting the program remains a pleasure and a privilege. BLUEGRASS SIGNAL: Happy 40th … To PT! NOTE: All the recordings used in this program are LIVE. 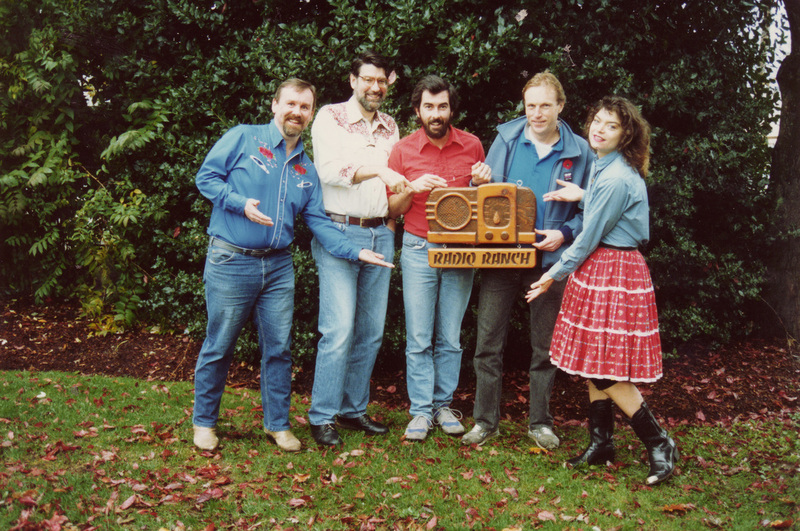 Below (L->R): Paul Norton, PT, Rob McGregor, Jim Burnett, Gwendolyn Reischman - the producers of "Radio Ranch"